HOW FAST DO YOU FISH? As guides, we are resigned to the fact and actually appreciate that every fishing day is a clean slate, a blank page mystery that will unfold as we work our way through the day. Some days both the plan and execution are brilliant and some days we fall a little short. HOW DO YOU DEAL WITH CONSTANTLY CHANGING FISH BEHAVIOR AND LOCATION? It is my strong belief that the strategy of fishing the extremes each and every day allows me to more quickly pin point the keys to that day’s pattern. Many anglers choose to fish at a medium depth, with a medium sized presentation, at a medium speed and they continue to use the “medium” approach even as they try many different locations. Not surprisingly, their results are usually mediocre. The “change of pace” approach is the intentional and systematic fishing of the extremes; shallow, deep, fast, slow, aggressive, subtle, sand, rock… The combinations are endless, but time is your enemy. The bottom line is that I know that I will more quickly learn the best pattern for the day by changing pace. Every new spot is a mini-experiment and I will compare the results to what I have learned from earlier in the day. The experiments continue until I find the size and walleye volume that we expect or were hoping for. There are some days and conditions that require a subtle and slow presentation. At times, the only way to catch a walleye on a tough bite is dead sticking live bait. I’ll do it when I have to, but I know that the odds of having a memorable fishing day are low. We may be able to scratch out a few big ones, but it is unlikely that we will fill the front and the back of our daily guide sheet. In the back of my mind, I am always watching for the signs that lead me to aggressive and active fish. The absolute best fishing days are the result of finding the combination of location, depth, and really active fish. Your results will still be pretty good to OK, even if you are using a “medium” approach or even dead sticking. But here is the key! If you want to maximize your results, then you should move as fast as the fish will let you. Years ago, there were a group of Silver Water Wheel guides fishing the same gradual sand flat. Everyone was being courteous and giving the other boats space, but I was back trolling at twice the speed of the other guide boats. There were a couple of wise cracks made at the “nightly round table” meeting, but when it came time to compare results, my boat had landed more than twice as many walleyes over 25 in. than any other boat on the same spot. I explained to the crew, that I recognized an aggressive walleye bite, and intentionally increased my pace. THE FASTER YOU GO, THE MORE WATER YOU COVER, THE MORE WATER YOU COVER THE MORE FISH YOU CONTACT, THE MORE FISH YOU CONTACT, THE MORE YOU CATCH, THE MORE YOU CATCH, THE MORE LIKELY YOU ARE TO CATCH MONSTERS. Hi speed theory is a game of numbers, time, and efficiency. You still have to find the aggressive bite, but when you do, you have to be ready to maximize it. I am constantly watching for the conditions that may trigger an active bite and always begin the day with speed. The faster you fish, the faster you learn. I have long been a fan of plastics for walleyes. 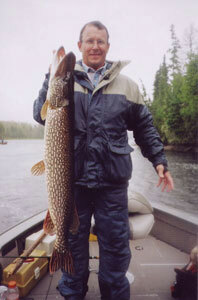 In fact, my walleye guiding career began on a lake in NW Ontario where we didn’t have access to live bait. We caught almost all of our walleyes on 3 – 4 in. white Mister Twister tails on a jig. The jig and twister combo is still very effective, especially when pitched up in to shallow water during the spring. There are a mind blowing number of different types of plastics on the market today, but my favorites are some of the recent additions to the Berkley Gulp Alive line. We have experimented with many different types of baits including many of the different sizes and styles of swim baits that have received so much attention in recent years. 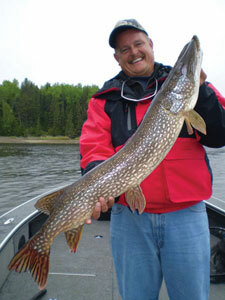 In our experience on Lac Seul, the Gulp Alive 4 in. Minnow, 5 in. Jerk shad, and 5 in. Crazy Legs Jerk Shad have been far more productive for both size and numbers of walleyes. With all of the gimmicks and gadgets for sale in the fishing and hunting world, I am definitely a cynic. And I was skeptical when I heard the Gulp Alive pitch. After using it and making side by side comparisons, I am convinced that there is a taste/sensory cue involved with this product. I have many times been fishing these baits with speed and have had walleyes hit, miss, and then chase down these baits. Equally important, I feel like the size, shape, and action of these baits more realistically mimics the smelt, which are the dominant forage for Lac Seul walleyes. 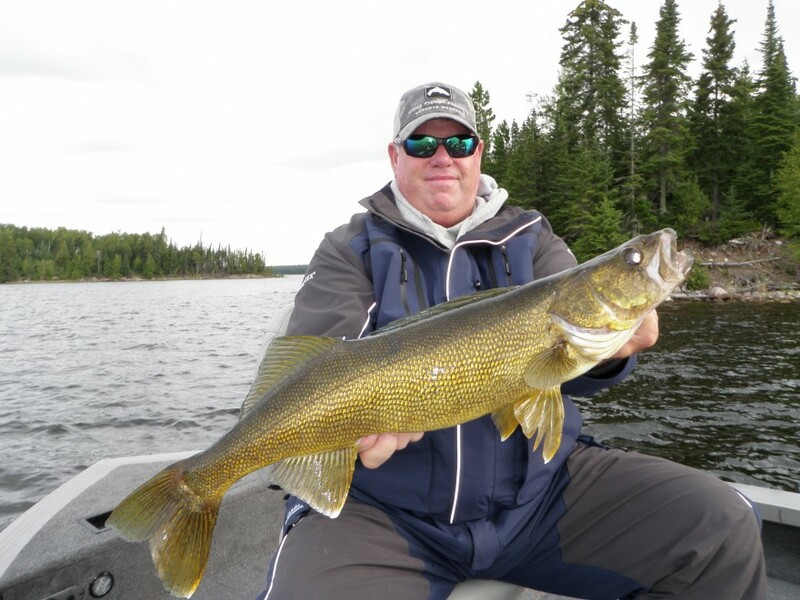 Some of the most productive June and Early July walleye locations on Lac Seul are large tapering sand flats with very subtle structure changes. Years ago, I would have ignored these spots, because it would have taken too long to fish them with the types of presentations I was using. Some of these structures are more than a mile in length and can be more than 200 yds wide with contour changes of less than a foot for every 20 yds. Often the walleyes are not concentrated and aggressively roam these flats in search of bait fish. 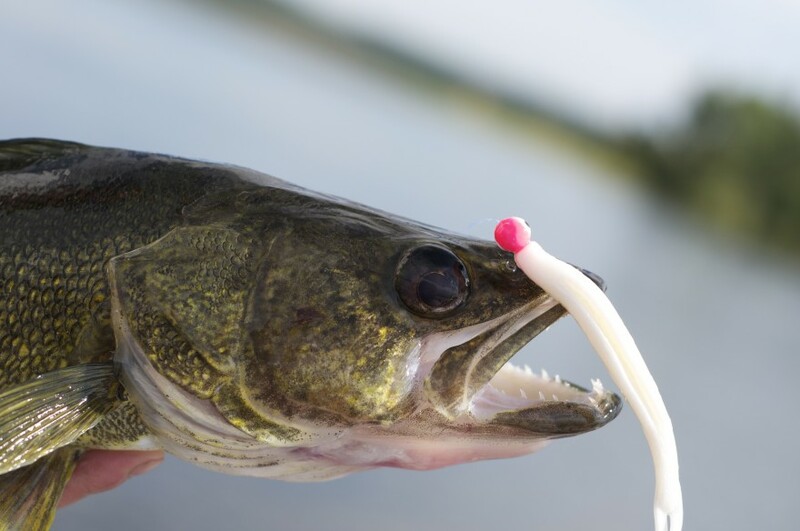 You can catch the occasional walleye by vertically fishing live bait, or you can adopt a presentation that covers water quickly and makes it possible to catch a bunch of big walleyes. Bottom bouncers with spinner harnesses can be very effective in these types of locations, but I would often mark huge balls of baitfish along with giant hooks suspended half way off the bottom in 10 – 16 ft. of water. I became convinced that we were fishing under some of these fish. I experimented with cranks with limited success. Swim baits were also OK, but it wasn’t until I modified my techniques with speed and Gulp Alive that we developed a technique that quickly locates aggressive walleyes on the flats, but also selects for Big fish. I call the technique “rip jigging.” To begin with, you have to beef up your gear. 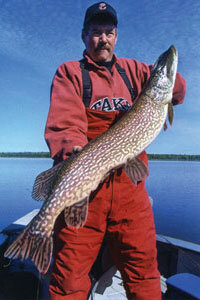 Many of my guests use their pike casting combo. I prefer a MH 7 ft. bait casting rod spooled with 30 – 50 lb. braid and tipped with a 14 lb. fluorocarbon leader (20lb. in rocky areas). My go to bait is 3/8 oz. Offshore Angler long shank round head salt water jig with a 4 in. Gulp Alive minnow. The technique requires a leap of faith, as it doesn’t look anything like the way your Grandfather taught you to walleye fish. The first 6 lb. walleye that nearly jerks the rod out of your hand will be all the convincing you will need. I cast the bait as far as I can. Count it down close to the bottom and snap the rod to 12:00 while reeling at a medium to fast pace (about the speed that you would crank a shad rap or a spoon). I snap the rod every 4 – 5 cranks and pause it a couple of times each retrieve to nearly touch the bottom. The hits can be violent. But the walleyes can also bump or miss the hook. When they do, continue the retrieve and as soon as the slack comes out of the line snap the rod tip again. Many walleyes will follow up and hit a second time. I cover water quickly and have my guests make random fan casts in all directions. Pay attention to where you hooked a fish or got bumped. 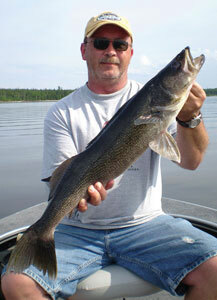 I advise my guests to cast back repeatedly and often pick up several walleyes out of the same roaming pod. I also try to identify areas with increased numbers of bait fish. When a hot bite fades, I will often drag live bait through that day’s hot areas before I leave to check out another location. If a sand flat produced quality size, I will often spot check that area again later in the day. It is not uncommon to have multiple waves of fish move through these areas in a day. I have had many guests and guides over the years skeptical or reluctant to try this technique. Often, I would have boats using traditional walleye techniques move in to fish near where I was rip jigging. It didn’t surprise me that my guests caught more fish, but I was shocked at how effective rip jigging was for selecting size. Big walleyes crush these baits fished at speed. We have had good success with many variations of this technique. The 5 in. jerk shads work well. I have had guests fish 15 lb fluorocarbon instead of braid. Lighter jigs and heavier jigs have both produced well and I am certain that we will be fine tuning this presentation in the years to come. If you think you are fishing this bait too fast or too aggressively, you probably aren’t. The way I have explained it to guests is that when walleyes are aggressive on Lac Seul, they will chase down a size 14 Husky Jerk, a 1 oz. Daredevle, or even a Mepps Giant Killer. The trick is to move fast, cover water, and let the walleyes tell you what they want. As we fish into the summer months of July, Aug., and Sept., the walleyes tend to move deeper. It isn’t a straight line movement. They will pulse both shallow and deep throughout the fishing season, but on average they will spend more time in deeper water as the summer progresses. Casting and rip jigging techniques are very effective in 4 – 16 ft. of water, but they become less efficient as fish move deeper. The main lake basins of Lac Seul are littered with expansive sand flats and “mega sand” structures that top out anywhere between 10 and 40 ft. In an attempt to capitalize on what we had learned from developing the “rip jigging” technique, we began to experiment with bigger jigs in deeper water. The popularity of braided line was significant in the development of this system. The low diameter and low stretch of braided line not only increases your “feel,” but it also allows you to fish lighter jigs deeper at speed. The technique is very simple and you set it up in much the same way you would a trolling pass with bottom bouncers. While backtrolling, drop the rig over the side and let line out until it hits the bottom and your line angle is more than a 45 degrees angle to the water. Engage the spool and let the bait glide 1 – 3 ft. above the bottom. I drop the rod tip back every now and then to make sure that I am still near the bottom, but constant contact isn’t necessary. Every 10 – 20 seconds, I give the rod a short but sharp twitch. The bait doesn’t move far, but it does hop. More than 75% of your hits will occur immediately after the twitch. It is my guess that walleyes will follow the bait and the twitch closes the deal. If you set the hook and miss, instantly point your rod towards the front of the boat. Backtrolling speed is constant, so when the slack comes out of your line, twitch it again. More than half the time, a walleye that missed on the first hit will strike again. Jig sizes vary with conditions and depth, but I prefer to fish 3/8 and ½ oz jigs. I will fish ¾ if I have to, but this size rig can become clumsy. I usually keep the boat between .8 and 1.2 mph. My favorite plastic for this technique is the 5 in. Gulp Alive Crazy Legs Jerk Shad in white. The small legs have some action in the glide, and the entire bait snaps when it is twitched. 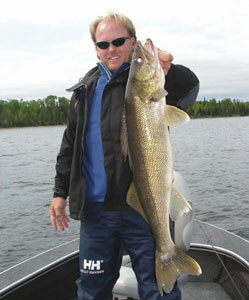 When casting shallow water in June with Husky Jerks, we often have smelt follow the baits back to the boat. Often, it is a single bait fish, sometimes it is several. Their movement in the water is very distinct; they swim in fast and glide and then dart to the side. I feel like the “twitch” or “snap” with the Jerk Shad very closely mimics the action of naturally swimming smelt. Again, you have to pay attention to what your electronics and what the fish are telling you. If on the first two trolling passes you mark tons of walleyes and baitfish and catch 4 -5 fish per pass, but on the fourth pass the fish disappear from the graph and you get just 1 bump. It may be time to slow down and fish live bait or move on to another spot. I use this technique to not only get a feel for what mood the fish are in, but It is also an excellent technique to quickly scout out new water. Because we are moving so quickly, I don’t have to rely on known “Grade A” spots that historically have concentrated walleyes. In recent years, we have returned to areas considered Grade C or worse and used this presentation to turn surprisingly large numbers of big fish. Many areas considered poor because they didn’t have a “spot on spot” to concentrate walleyes for a vertical jigging live bait presentation, still hold numbers of large individual walleyes. The trick is to fish these areas with speed and cover water quickly. When given the choice to dead stick 1/8 oz jigs with live bait over neutral to negative walleyes or backtroll Hi-Power plastics at speed, you know what my answer is going to be. On any given summer day, if the walleyes will let me fish fast, I will. And to date, I have found no more efficient technique for numbers of big walleyes than fishing Hi-Power Plastics at Speed. We all know one of those guys; the fisherman who routinely out fishes the rest of the group. Is it just good fortune or is there something else involved? I can’t speak to all fishing situations, but there are several similarities shared by our consistently successful guests. Sure, fortune plays a role, but consistent success occurs when chance happens to those that are prepared for it. The odds of being a successful trophy angler improve exponentially with increased preparation and effort. 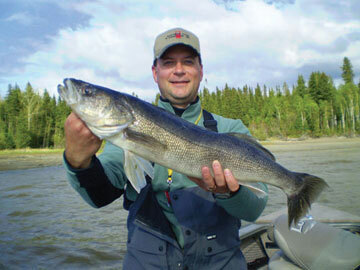 The first step is to choose a body of water that supports a trophy fishery. 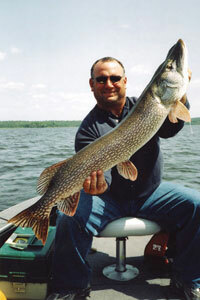 If you have read this far into our website, then you know that Lac Seul definitely fills this square. With more and more informed fishing pressure on the water, today’s consistently successful walleye angler is typically a creature of high tech habit. In recent years the world of walleye angling has undergone incredible changes. We now have super lines and super boats, GPS and LCRs, planer boards and snap weights, the options and opportunities are limitless. With all this technology in hand, It is easy to overlook the fact that at times the super-tech approach may not be the most efficient or effective way to catch walleyes. One of those occasions is early season action on the Canadian Shield. Like most walleye anglers, I’m constantly looking for ways to land more and bigger fish. I still find time to experiment with new tackle and techniques, but over the years I’ve found that early season is a time when a ‘low tech’ approach often puts more walleyes in the boat. How do you know if a lake has old fish? Find out if they have to release big ones. Big Fish Don’t Live in Small Ponds! Sure, you will occasionally find the odd big fish living in a smaller lake, but a consistent Canadian Trophy Fishery will always be found on a larger body of water. Specifically, the Diversity of Habitat and the Abundance and Diversity of Forage associated with a big lake are the key factors that result in large numbers of big game fish. To truly thrive, walleyes and northern pike require specific types of habitat that change dramatically throughout the year. In early Spring, warm marshes and rivers serve as the major spawning areas. Large fertile bays become nursery areas for juvenile game fish and feeding grounds for adults in early Summer. And during the Summer and Winter months, main lake basins not only provide a thermal refuge but also serve as home to some of the most important species of prey fish. Life is hard in the North. To grow big, fish need options. They require diverse habitat and an abundance and variety of nutritious forage fish only found in a larger body of water. As you sort through the piles of camp brochures, all with the same claims of “Trophy Walleye” and “Big Pike”, it is difficult to decide which claims were more accurate 10 years ago, which are completely false, and which are just slightly exaggerated. Fortunately, there are ways to evaluate the true Trophy Potential of a body of water before you fish it. To reach trophy proportions on the Canadian Shield, fish need to do only two things; live long and eat well! Though that statement seems obvious and simplistic, most visiting anglers don’t realize how difficult that task can be in most lakes and rivers. The two most important factors that separate marginal water from trophy water are the Size of that body of water and Fishing Pressure. With a minimal amount of information about an unfamiliar body of water, you can quickly make an informed opinion as to its’ Trophy Potential. 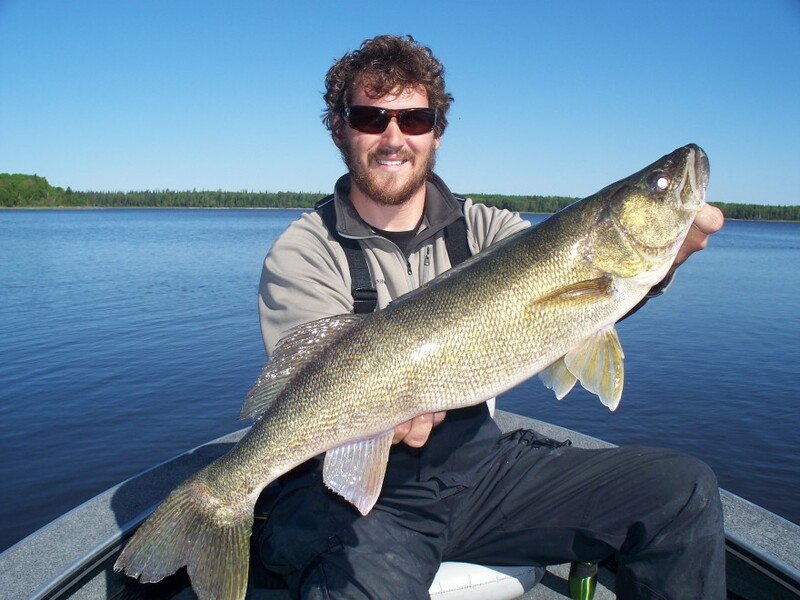 Walleyes in super shallow water in Summer, the turbid water connection, and “Mega-Sand” structure walleyes are just a few of the discoveries we have encountered on Lac Seul over the past five years. I am anxious to see what more surprises we will find over the next 5, for I feel that we are still on the steepest side of the learning curve. Lac Seul can be challenging, but in the end, isn’t that what makes the puzzle fun? 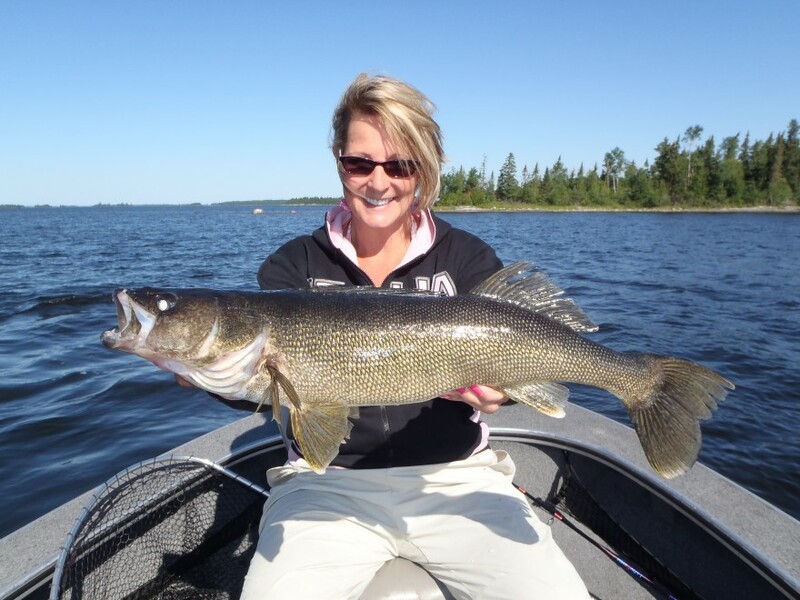 It is that challenge and the pursuit of Giant walleyes that are at the very heart of why I love to guide on Lac Seul. 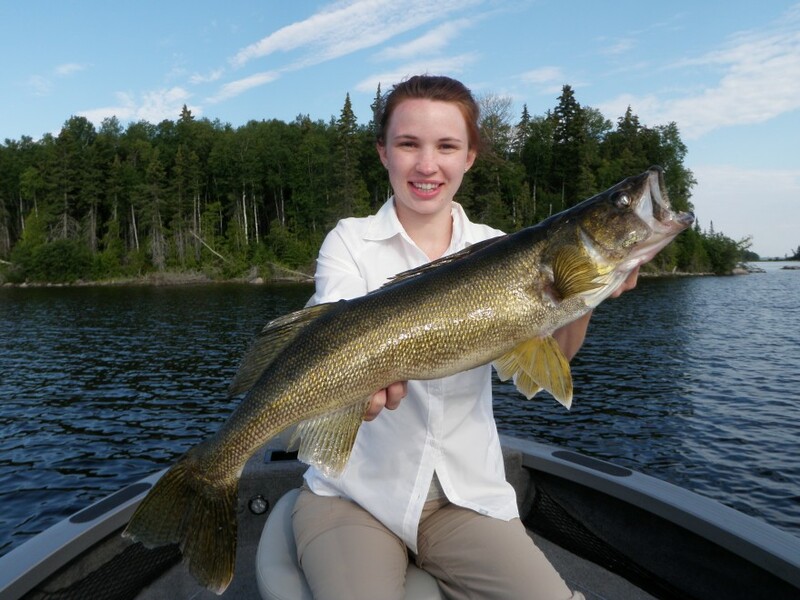 Most knowledgeable walleye fisherman are pretty comfortable with the widely recognized structural features associated with the main lake basin. Sunken islands, sand bars, points, and saddles located in or near the deepest water of the main lake are all considered magnets for walleyes during the summer months. It wasn’t until I began fishing Lac Seul’s big Summer walleyes that I began to understand the importance of what we call “Mega-Sand” structure. Mid summer several seasons ago I was guiding a group of fishing industry professionals representing Berkley, Cabelas, and others. Professional Walleye Tournament Angler, Eric Naig, was fishing with me along with Jim George, an old friend from Cabelas and now with Berkley. I had just met Eric and felt a bit more pressure than normal fishing with a Pro. Traveling on the way to fish some main lake structure, I noticed a cup shaped length of shoreline that was being hit by wind driven waves. The shoreline was a grey clay bank and the result was a 75 yd. wide band of extremely murky water stretching out from shore. I took a sharp turn and positioned my boat on a subtle breakline right in the middle of water that could best be described as the color of weak chocolate milk.